I was going to make jam to sell at the farmers market with these pears. 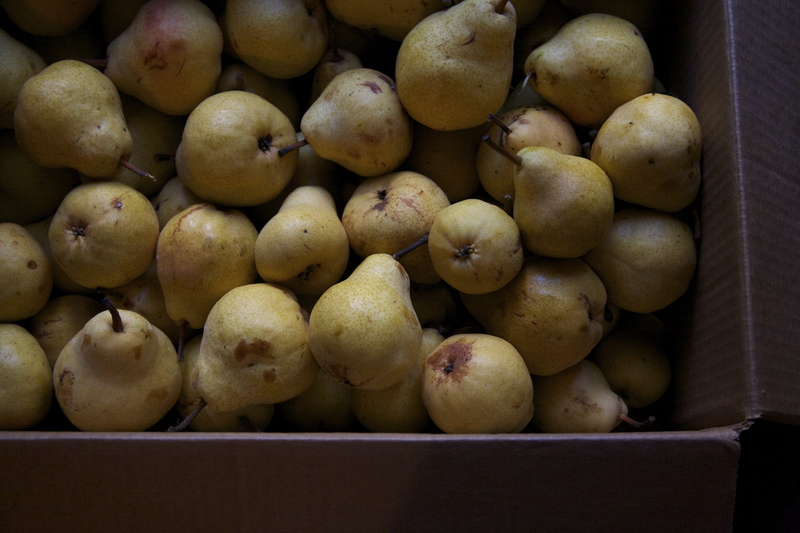 Local bartlett pears are one of my absolute favorite fruits to work with — they’re just so juicy. So sweet. I love them. I started eating a few fresh and then said screw it, I’ve gotta stash away a bunch of these for us. (I’m still going to make jam with some of them though, don’t worry). Choose pears that are ripe but still firm. I should have done mine a few days earlier because they didn’t want to hold their shape very well. I’m sure this would be delicious with a cinnamon stick or some vanilla added in, but I didn’t have either in the pantry right now and was too lazy to go out to the store. First, prepare the pears. Combine about 6 c. of water with the lemon juice in a nonreactive container. Peel the pears, slice in half, remove the stem, and remove the core with a spoon. Put the prepared halves in the lemon juice bath to keep them from browning. Prepare boiling water canner, jars and lids. Drain the pears. In a nonreactive pot, combine the water, maple syrup, 1 tbs. lemon juice and sugar. Bring to a simmer and add the pears. Cook on medium heat for 5 minutes. 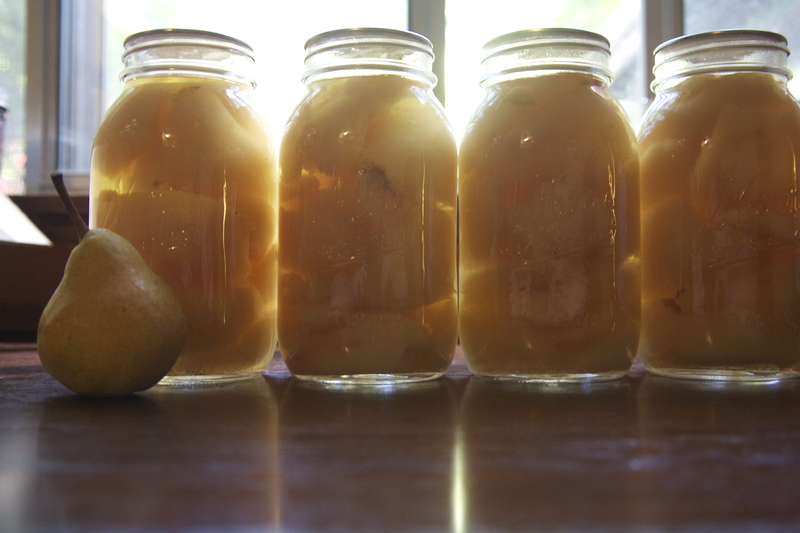 Gently transfer the pears into the jars with a slotted spoon and ladle the syrup to cover, leaving 1/2″ headspace. Remove air bubbles with a chopstick and adjust headspace as necessary. Process in a boiling water bath for 25 minutes, adjusting for altitude as necessary. Great idea, I’m definitely going to use maple syrup for mine now, thanks! I’ve been wanting to use maple syrup as a sweetener in canning, but I haven’t found any references for safety except for replacing a small percentage of the sugar. The Ph for maple syrup is usually stated as 5.15, but a research study on samples back in 1996 came up with Ph values of 5.6-7.9 so there appears to be a wide range as well. Soooo… I’ve always been concerned about how much acidification is req’d to lower the Ph to the safe threshotheir 4.6. Can I ask how you arrived at the proportions you used? Hi Sherri! I’m worried that the logic I was using wasn’t quite right, so I’m checking with a few experts and I’ll update the post later today. Good Eyes, oh my goodness! Thanks for the updated recipe! I just went pear picking with the kiddos and was thinking about what we are going to do with them. I think I will add vanilla beans in some and cinnamon in others…What do you think about making pear sauce with the maple syrup and sugar and reducing/eliminating the water for the syrup? I think that would make a lovely sauce! I would add the juice of a lemon or two into the sauce to help keep it from darkening over time. My dad’s coworker sent me a huge bag of pears from his tree and I just put up 4 quarts of these! They look so pretty and smelled so nice, I can’t wait to try them. Thanks! Well, I used the original recipe, no sugar. Should I be worried? Or I guess I should eat them now? And any idea on what the coloring would start to look like if they went bad? michael, i would just get rid of them. I feel awful that I posted a bad recipe. E-mail me your address and I’ll mail you some pears I made with the updated recipe to replace yours. The original recipe with just maple syrup should have had some more lemon juice in the syrup, not just the soak for the pears. The problem is, I’m not 100% sure how much lemon juice, so I just changed the recipe and added some sugar. Such a bummer, I’m SO sorry! Hi!! I don’t think your original recipe was unsafe like you are thinking — I found THIS thread….. http://mrssurvival.com/forums/index.php?showtopic=25808 ……and if you look at the 3rd and 4th posts, you will see that they say it’s not a safety issue to can syrup, it’s a taste issue. One of them found a site that said canning maple syrup for 10 minutes in a water canner would last 1 year — so obviously it is safe to ADD to recipes that we are canning. AND there is a recipe on THIS site…… http://www.canningcraft.com/?p=2455 …..where she doesn’t use any sugar, and uses lemon juice (for taste, I’m sure). I just found this recipe, and given that I have pH paper around (0-7 scale), I checked the pH for a dilution of 1/4 cup of maple syrup in 5 cups water. The pH is about ~5; I added 1/4 cup sugar and 2 Tsp lemon juice and the pH dropped to ~4. My canning book (the Bernardin guide) says that most fruit can be canned in water – I don’t want to get too technical here – because the natural fruit acidity and sugar are sufficient for preserving the product. I just wondered whether the maple syrup could somehow neutralize the fruit acidity. To test this, I added another 1/4 cup maple syrup and the pH stayed at about 4, so it should be very safe. Cheers!